App Store Optimisation (ASO): What is it? Improve the development with insights from the app and competitor’s analysis. Essentially, the ASO boost the visibility and performance of the app on the online stores. The ASO strategy attracts organic results and increases the brand awareness towards the users. Our App Store Optimisation services include: discovering your target-audience, audit your competitor’s strategy, keywords audit, optimization of the app’s presentation, recommendations and monthly activity reports. Why optimise applications in the Stores? The use of mobile devices grows 58% year after year, followed for a 24% increasing of app’s usage. Furthermore, 85% of the users prefer to use mobile apps instead of mobile websites. In this scenario, the digital presence on the app stores is fundamental to the digital marketing strategy of any business. And the Apps optimisation is not only important, but essential. Every month, the GooglePlay Store and the iTunes Store receive approximately 60.000 new applications. It is in this market of fast ascension and high competition that your app needs to stand out from the sea of competitor’s to achieve a good performance with the users. It is important to highlight that in the Play Store, 40% of the apps downloads comes from the search results. On iTunes, this amount is up to 65%. This demonstrates how to use the right keywords is critical for your application to be found. Additionally, the volume of downloads directly impacts your rankings and the consumer’s decision. For businesses that have online stores, the mobile market is even more important, as 1 in 2 users uses applications to help taking the buying decision. And 29% of purchases are made through mobile apps. 45% of the users search for more information about products and services before purchasing it. To not have a presence and, especially, not optimizing your presence on the mobile market means losing a business opportunity and potential clients every single day. This is why the App Store Optimisation is more than necessary for the digital strategy of any business. We deeply audit your competitors to perceive their weaknesses and strongness, opportunities gaps and finding out their strategy so that you can overcome them quicker and more efficiently. 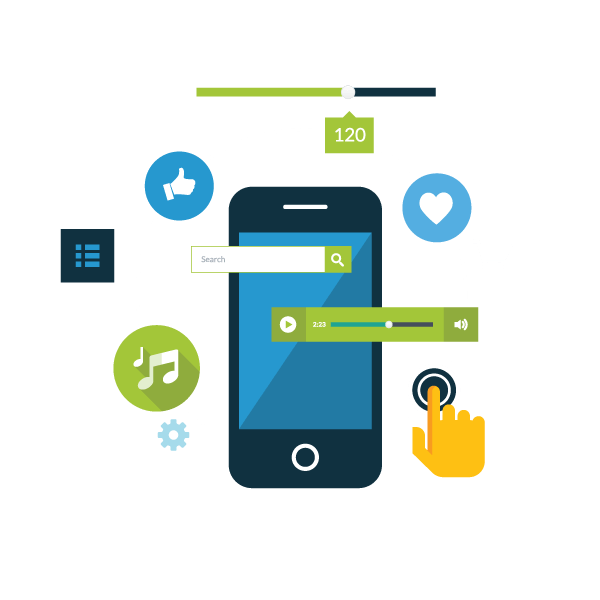 By analysing the keywords that best addresses your audience needs, we optimise the content of your presentation on the Apps Stores, making your app more easily indexable by the search mechanisms and easily findable to users. Through the usability and browsing analysis of your application and a deep audit to your competitors, we will follow up your unique features and recommend improvements that can be adopted to boost your performance. We directly follow up your app performance along the implementation of the ASO strategic plan sending, monthly, a report with all the information necessaries, so that you can accompany our work and the achieved results. Our team of App Store Optimisation professionals is at your disposal to help you with each part of the strategic planning that will increase the performance of your application on the App Stores. Our goal is to optimise your application, recommend and indicate the best practices, but, mostly, we are here to leverage your visibility on the search results of the app stores and helping you to reach an excellent ROI!